Money Q&A: Are energy companies going to cut prices? Q: Are any energy companies actually cutting their prices this year? A: Amazingly, there is one company who has defied the ‘Big Six’ energy providers’ recent price increases and will actually cut the cost of electricity on 21 December this year. Ethical energy provider, Co-operative Energy, is reducing its electricity charges by 2% from 21 December 2012, making them £88 cheaper than the average Big Six standard tariff for online direct debit and £178 cheaper for offline quarterly credit. However, it is worth noting that standard tariffs are always the most expensive offering from any energy firm, so before you rush off to switch to the Co-op, make sure you compare energy tariffs for your specific energy use to see which deal will work out cheapest for you in the long run. Take, for example, EDF. After previously pulling popular fixed rate tariffs this summer, and announcing a 10.8 per cent increase on standard variable prices from last Friday 7 December, EDF have now announced the launch of a new fixed tariff, Blue+ Price Promise June 2014 tariff (http://my.edfenergy.com/gas-electricity/blue-plus-price-promise). Prices on this tariff are fixed until 30th June 2014 and there are no cancellation fees or penalties should you wish to switch prior to the end of the fixed date. The tariff costs £1,182 annually for the average dual fuel household, which is £210 cheaper than the national average of £1,392 a year. 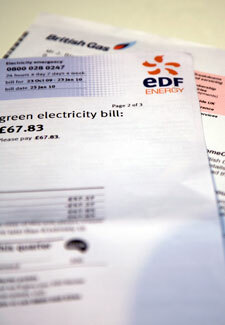 Although this is slightly more expensive than the fixed rate iSave V12 tariff (http://www.first-utility.com/home-energy/isave-tariff ) from First Utility, EDF’s no cancellation charge policy does make it more appealing in terms of flexibility should prices fall in the next year and a half. My best advice is to check on good energy comparison sites such as energyhelpline.com (http://www.energyhelpline.com/energy/rg_home.aspx?aid=102&gclid=CJTwrYnrgLQCFSTLtAodZBQA1g) or uSwitch.com (http://www.uswitch.com) for your best deal and then switch before the big chill really sets in.